"Grill up some excitement with this great recipe. 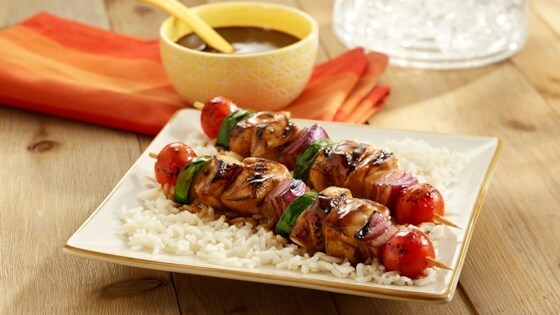 When tender chicken kabobs are flavored with La Choy® Stir-Fry Sauce and served over UNCLE BEN'S® READY RICE® Jasmine, delicious things happen." Got half an hour? Make this. The skewers were delicious. Apparently I bought the wrong type of rice for this recipe but needless to say the rice was very good. For a great summer meal, put your favorite meats and veggies on a stick and grill them, then serve on a bed of perfectly cooked rice. Our pop-in guests loved it, too!! This was a great weeknight summer meal! Healthy, flavorful, quick, easy cleanup...what more could a girl ask for?